You are browsing the archive for Astronomy. Tonight, a semi-rare astronomical event occurs, a full moon on the same day is the autumnal equinox. First, the full moon will be listed at Thursday, September 23rd because it it reaches its fullest point in the wee hours of Thursday morning. But moonrise tonight will be closer to the full moon than Thursday’s thereby making it “fullest” These are all minor technical points. The main idea is that tonight’s rising moon will be full and will occur on the same day as the Autumnal Equinox which for us is 10:09 pm CDT tonight (22nd). This only lines up every twenty years or so. It’s a Super Harvest Moon! The Harvest Moon is the closest full moon to the equinox always. But it’s not just a full moon, it also rises right around or after sunset. It is these two facts which actually extended harvest time beyond sunset back in the days before practical lightning for farmers. The Harvest Moon usually occurs in September but can be in October occasionally, which ever full moon is closest to the fall equinox. The Autumnal Equinox: it is a point in the earth’s orbit around the sun at which neither the northern or southern hemisphere is receiving more direct sunlight. Does one hemisphere ever receive a greater or lesser share of the sun’s radiant energy? Sure! Because the earth has, for our purposes, a constant tilt with the plane of its orbit around the sun, an imbalance of solar energy occurs. The tilt is 23.5 degrees. Mercury has practically no tilt while Pluto is on its side at 119 plus degrees. There are four distinctive points worth talking about. We’ll leave the Solstice points for now and come back to them on the first day of winter. The two equinox points occur opposite of each other in orbit. At these points, the tilt of the earth doesn’t come into play, all points on earth are subject to the same period of time (12 hours) sunrise to sunset. In orbit, it is the time when the earth’s axis is at right angles to the sun. This is often referred to as the astronomical beginning of fall and is completely defined by the earth’s orbit around the sun. It has little bearing on the actual weather occurring on or near the equinox. Actually, meteorological has been defined as the months of September, October and November. Another question often raised is: why don’t we actually experience the said 12 hours? I do the math and it doesn’t work out! It has to do with refraction and latitude and is explained well here. The Perseid meteor shower should peak tonight as the earth passes through the most dense portion of the wide comet trail of Swift-Tuttle. The peak could be as high as 100 meteors per hour although this can never be accurately known and certainly can’t be pinned down to the specific hour. Clouds in the Ozarks this afternoon are turning into showers and storms and what typically happens is the lower portion of these storms will vanish but will leave “debris” or leftover clouds up high. I doubt these will cause any serious obstructions to viewing. Another aid will be the lack of a moon tonight, helping to make the sky as dark as possible. You will what to help yourself in this regard by getting as far away from city lights or local light sources as possible. Lots of people have been asking when and where to look. The when is easy, the darkest time of the night so if you are too close to sunrise or sunset, your chances are limited. Only the very largest meteors will be visible during let’s say twilight and since many people will be awake still during this part of the evening, these meteors often obtain a lot of attention when and if they occur! Where? 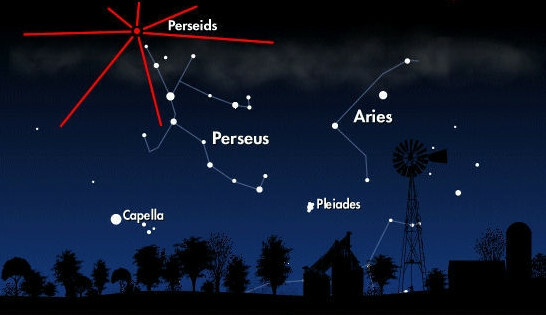 The radiant direction is the point in the sky where meteors will appear to be coming from and in this case it is the constellation Perseus which at around midnight will be in the northeastern sky. Of course, the constellation rises the later it becomes. I really think just looking up and watching carefully will do just fine. Two meteor showers are fairly reliable each year, the Perseid and Leonid, and one of them is coming up later this week. 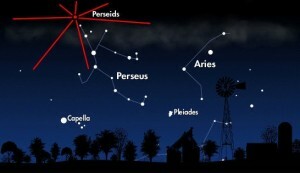 For the upcoming Perseid meteor shower, the best viewing for this should be Thursday night. Keep in mind that meteor showers are a bit unpredictable in terms of intensity and peak occurrence so you will likely start seeing meteors this week, reaching a peak later in the week. I would say over the weekend too but clouds will start to be an issue for us. Looking for meteors is pretty straightforward. Just make the sky as dark as you can meaning get away from all bright lights. 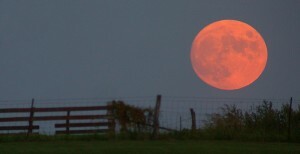 Viewers will be helped out this year by the absence of a bright moon. You may read about radiant directions of meteor showers. These are the direction most meteors will appear to radiate from and are named after the constellation the radiant point is closest to, in this case it is Perseid the Hero from Greek mythology. Truth is, you will see meteors everywhere in the sky. The weather looks good. Skies should be mostly clear. Any clouds would be the result of leftover or debris from any storms that manage to pop up in or close to the Ozarks. Northern Lights, Well, Up North! The Aurora Borealis or Northern Lights were observed last night across northern Europe and North America. This was the result of an interesting show on the surface of the sun on Sunday, August 1st. According to Spaceweather.com, two CME’s (Coronal Mass Ejections) occurred on the side of the sun facing earth on Sunday. The first arrived yesterday afternoon and was responsible for last night’s mild light show. The second CME is due to to hit earth August 4/5. 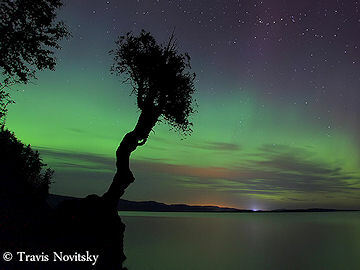 This will likely result in more northern light sightings at high latitudes again tonight. For our latitude at approximately 37 degrees north, the Aurora Borealis is difficult to see. Some clouds may be a problem later tonight for folks living north of Springfield. The sun exhibited some interesting behavior on August 1st, you can read more about it here. The upshot of this activity is a coronal mass ejection (CME) is headed toward earth and will start interacting with the earth’s magnetic field on Tuesday, August 3rd. 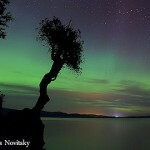 This means that the Aurora Borealis or Northern Lights might activate! Now, at our latitude here in the Ozarks, seeing the Northern Lights is always difficult. But it does appear is if skies will remain clear enough to have a shot at seeing something if it occurs. Remember to get where it is dark and where you have the best view of the northern horizon!